The Sudan has a history of popular uprisings to depose oppressive or disagreeable governments, prior to the 1985 insurrection. In 1964 the October Revolution consisted of a widespread general strike led by the National Front for Professionals. The organization joined forces with political leaders to create the United National Front (UNF) and, along with dissident military leaders, this coalition succeeded in dissolving the Abbud regime and transitioning to civilian rule. 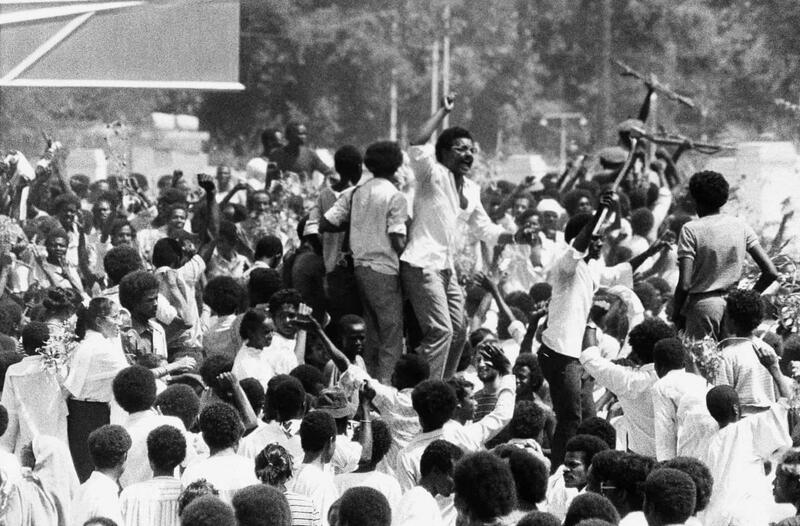 Later, in August of 1983, schools throughout the capital of Khartoum closed as students protested poor social conditions in the city. In the years leading up to the 1985 strike campaign, several strikes took place in Khartoum, including a professionals strike in 1983 of judges and lawyers, who opposed President Numeiri’s instatement of Islamic sharia law, and a 1984 doctors’ strike calling for better pay and improved conditions in the health services. Sudanese President Muhammad Numeiri came to power in a military coup on May 25, 1969, replacing the government of President Ismail al-Azhari with Numeiri’s Revolutionary Command Council (RCC). After his transition to power, President Numeiri saw several unsuccessful attempts at overthrowing his regime, first from the Mahdists in 1970 and later from the Communist Party of Sudan (SCP) in 1971. Under his rule, Sudan signed the Addis Ababa accord in February 1972, aimed at ending the devastating civil war in the south of Sudan. However, the accord ultimately had very little success in ending the conflict. Later, in 1983, Numeiri implemented Sharia law throughout the country, applying it to all citizens regardless of whether or not they were Muslim. This move met with extensive criticism and public outcry from those opposed to Islamic law. Another feature of Numeiri’s government was the formation of an internal security force of some 45,000, separate from the country’s military and under the direct control of the president. These security personnel had access to weapons caches throughout the country and their own radio, television, and communications network. They also reportedly acted as spies for the regime. Under the constant threat of infiltration, any opposition to Numeiri was stifled. Sudan during Numeiri’s rule experienced severe economic deterioration and debt, rising food prices and food shortages, and a general decline in living conditions throughout the country. Directly before the strike broke out, the government increased the price of even the most basic commodities by 33 to 100 percent. The increase came under the auspices of austerity measures imposed by the International Monetary Fund and the United States as a way to improve the economy, despite the widespread poverty and starvation among the Sudanese population. It was these major issues, coupled with the popularly held perception of Numeiri’s government as oppressive—the leader had declared several strikes and union organizations and their demands illegal—that had a direct impact on the rise of the 1985 general strike. The campaign began with spontaneous student demonstrations. On March 26, the eve of a presidential trip to Washington, DC, students from the Islamic University of Omdurman marched through the city. They shouted, “The people are hungry! Down with America! Down with the IMF!” On the day of the president’s departure, trade and technology students marched through Omdurman, ravaging the offices of banks and commercial buildings, including some owned by the president’s brother. Yet Numeiri continued with his visit to America, leaving the government’s administration under the control of Defense Minister Siwar al-Dahab. From there, the campaign organized and expanded. On March 29, workers and unemployed citizens from the capital and surrounding areas flooded into Khartoum and marched through the streets. They shouted slogans propagated by the Communist Party and destroyed emblems of wealth. The Communist Party released a public statement on March 30, calling for an unlimited general strike in Khartoum until the defeat of the government. The next day, Sudanese professionals—lawyers, professors and academics, judges, doctors, nurses, and engineers—joined with the Trade Union Assembly for National Salvation (a conglomeration of railway, textile and bank employees’ trade unions) to add their support to the strike. The strikers operated in conjunction with the political parties opposed to Numeiri’s government. The Sudan Popular Liberation Movement (SPLM), a Sudanese rebel group led by John Garang de Mabior, was also brought onboard with the concession that the policy of sharia rule of law would be abolished by the new government that would replace Numeiri (an end to Islamic law was the SPLM’s greatest demand). The political parties and professional/worker groups hoped to hold a mass demonstration on April 3 that would bring the Sudanese army over to the side of the opposition. In the interim leading up to this show of protest, opposition leaders circulated statements by anonymous “free officers” that denounced Numeiri and his regime. While “higher-up” secret negotiations occurred between political opposition leaders and military officers, civilians carried on the strike activities and held large demonstrations. In a particularly salient example of the changing power relations within the country, a counter-demonstration in support of the regime was held on April 2, but failed to garner more than a thousand participants (most of whom were dignitaries and regime officials). The next day, April 3, was the largest demonstration in Sudanese history, bigger than those of both the October revolution and the 1956 celebration of independence. Between one and two million people marched through Khartoum to express their discontent with Numeiri’s regime and call for an end to the repressive government. In the face of such a massive movement of people, the security forces and military retreated peacefully. The next day, General al-Dahab met with the opposition leadership. He accepted their demands that he not declare a state of emergency or use armed force to put down the popular uprising. No action was taking to halt the demonstrations. In the meantime, leaders within the groups of the political parties, trade unionists and professional associations met to draft up a unified leadership and program with common goals. They adopted this “national charter” on the night of April 5, bringing it into operation on April 6 as President Numeiri returned to Sudan. The military generals, now working alongside the political opposition, instigated a coup and installed a military junta with the total cooperation of General al-Dahab. Thousands of Sudanese who had been occupying the streets of Khartoum since the early morning expressed joy and celebration. A crowd of demonstrators even broke into the Kober prison and freed 400 political prisoners. All in all, ten people were reported killed during the course of the strike and subsequent coup. On April 6, 1985, the coalition of political opposition groups, professionals, and trade unionists established the Transitional Military Council (TMC), headed by General al-Dahab and a civilian cabinet of non-party professionals. They would rule jointly for a one-year transitional period, at the end of which free elections would be held to determine the new government. At the forefront of their political agenda were negotiations with and accommodation of the SPLA and John Garang. The opposing political groups had a relatively similar agenda, calling for: the end to sharia law; indictment of the former regime’s leaders and confiscation of their illegally acquired wealth; liberation of the economy; non-alignment in foreign policy; a constitution to guarantee collective and individual liberties, separation of powers, judicial independence, a multiparty system, the autonomy of the south, and a general election for a constitutional assembly to take place before April of the following year, when the transitional rule would be terminated. The TMC also promptly demobilized the internal security force set up by President Numeiri, confiscating their weapons and removing close to 400 officers from their posts. Upon his return to the country, finding his Defense Minister and first vice president to have sided with the opposition, Numeiri fled to Cairo where he remained in exile. The Sudanese campaign to end Numeiri’s rule has an interesting trajectory in that a spontaneous civilian-led strike offered an opportunity that was then appropriated by the political opposition to meet their ends. The students and workers, after all, were protesting the terrible living conditions that they suffered under, and the immense food shortage and prices increase. Once the striking activity was unified under the umbrella of the political, professional, and trade union organizations, with a centralized demarcation of goals, the coup took place and Numeiri’s government was dismantled. Unfortunately, the road from political transition to stability in Sudan was not a smooth one. General elections were held the following year, and Sadiq al-Mahdi, head of the National Umma Party, was voted in as prime minister. He led a coalition government comprised of the Umma party, the National Islamic Front, the Democratic Unionist Party, and four smaller southern parties. However, the coalition government was fraught with factionalism and corruption, and despite the Sudanese people’s initial exuberance over its transition to power, it lost much popular support due to its inconsistencies in policy, scandalous behavior displayed by their political leaders, and the nepotism of their Prime Minister. Despite its pronouncements to the SPLM, the 1983 sharia law implemented by Numeiri wasn’t revoked, drawing harsh criticism from Garang. In 1989, al-Mahdi was ousted from power in a coup led by Omar al-Bashir. Associated Press. “Doctors in the Sudan call for a general strike.” The New York Times. April 1, 1985. Miller, Judith. “Sudanese unions call off strike that led to coup.” The New York Times. April 9, 1985. Reuters News Service. “Leading Sudan doctors, laywers held.” The Globe and Mail (Canada). April 2, 1985. Rouleau, Eric, James, Diane, and Paul, Jim. “Sudan’s Revolutionary Spring.” MERIP Reports 135 (September 1985). pp. 3—9. S., Leonard. “Strike ends in Sudan as new regime settles.” Courier-Mail. April 1985. Salih, Kamal Osman. “The Sudan, 1985-9.” The Journal of Modern African Studies 28: 2 (June 1990). pp. 199—224. Woodward, Peter. “Sudan After Numeiri.” Third World Quarterly 7: 4 (October 1985). pp. 958—972. Additional useful source: Garang, John, and Manṣuur Khalid. John Garang Speaks. London: KPI, 1987.